The story of Pirates of the Burning Sea, the players who wouldn't let it die, and one developer who stuck with it all the way. "Are you a Firefly fan?" asks Brian Taney, the last remaining member of the Pirates of the Burning Sea development team. "If you sit down and you watch the episode Out of Gas, Pirates of the Burning Sea is like Serenity." In other words, Pirates of the Burning Sea, an 11-year-old MMO that has managed to eke out a humble life with a small group of dedicated players, is now like a ship broken down and adrift in space, its crew running dangerously low on oxygen. It's a grim metaphor. When you learn what it's taken to keep Pirates of the Burning Sea afloat for 11 years, it's remarkable that there's a game left at all. In August 2018 Taney wrote a heartfelt blog post to the players of Pirates of the Burning Sea. His tiny dev studio Portalus Games had lost a vital component—its only programmer. Taney's post, like the distress signal sent from the dying Serenity, was a last-ditch SOS. Dozens of heartfelt private messages flowed in from players. He still keeps a list of all their names. They wrote him to offer help as QA testers, game masters, and mentors for new players. They offered to volunteer their time for free. One even had experience modeling ships in 3D. On the forums, players passionately debated how to save the game and organized monetary pledges. The community made its feelings known: Pirates of the Burning Sea was worth saving. Again. Pirates of the Burning Sea has everything I expect of a 2000s-era MMO: Quests delivered by long-winded NPCs, guilds (called Societies), a contentious relationship between PvP and PvE players, and character models so low-poly they might actually be in style again. Where many other MMOs of the time period have become defunct, PotBS is still clinging to life, floated by diehard pirates who see something in it that they can't find elsewhere. "The entire game has so much character," says a long-time player I've given the pseudonym Blackbeard, as we parlay at a tavern in the in-game Charlesfort, Florida. "I can look around this bar and go: 'You know I never noticed there's a panther head above the bar.' Fires burning. Candles flickering. There's so much beauty within the game." Where an outsider like me sees the aging textures and stilted animations of this seafaring and swashbuckling MMORPG of the post-WoW boom, he still finds something to love. Somehow, after more than a decade, even lifetime players are still finding new things on the Burning Sea. They've found new rare fish and unique swords in the auction house. Another pirate, who I'll call Calico Jack, found an NPC named for the historical chess champion Raúl Capablanca deep in a series of chess-related quests unseen by most players. Seeing the NPC recite a quote from the real champion is a detail that would have been lost on most players, but it gave Calico Jack chills. When you learn what it's taken to keep Pirates of the Burning Sea afloat for 11 years, it's even more remarkable that there are still discoveries to be made, or that there's a game left at all. August of 2018 was not Pirates of the Burning Sea's first voyage into stormy seas. Brian Taney joined Flying Lab Software, the original developer, two years after launch in 2010. He was in charge of both quality assurance and customer service, and describes Flying Lab as a "full-blown team" at the time. About 25 devs were working on the game, with another 25 on QA and customer support. It was a luxury compared to the team of none he runs Portalus Games with now. "Flying Lab had the largest and most dedicated community relations team that I've ever seen. They had a live events coordinator. They had forums administrators. They had a guy who was on the IRC channels all the time just to talk with players. On top of that, we had GMs on every server 24/7 who were always interacting with players," he says. Calico Jack remembers how lively the game was in those early days, with Societies emulating real navies. "You actually had recruits and you had midshipmen and you had first mates, admirals, and so on and so forth and they essentially played in roleplay," he remembers. That golden age of piracy didn't last. Sony Online Entertainment, which had been publishing Pirates of the Burning Sea for several years, pulled support in 2012. Flying Lab Software, in response, planned to quit operating PotBS, though the studio still owned the intellectual property. Another longtime pirate, Richard Salois, says the news hit players hard. "When SOE and Flying Lab dropped [PotBS] we were upset and worried that we would lose this game. We honestly didn't know what to think." Taney, already a veteran of multiple online games before joining Flying Lab, was no stranger to layoffs, closures, and cancellations. He and a few other developers took the risky and unusual strategy of founding a new studio, Portalus Games, to continue running PotBS. "For the other guys, they were younger guys trying to build their careers and they saw an opportunity for good resume material. For me, I just love the game. I'd actually given up a fair amount to join [Flying Lab] in the first place. I thought 'Well yeah, I'll give this a try. What the heck?'" But without SOE, they needed a server host. Luckily for Portalus, two CEOs—Flying Lab’s Russell Williams and Darrell Benvenuto of server hosting company Vision Online—were already acquainted. PotBS was transferred to Vision's servers and against the odds, survived its first brush with Davy Jones' locker. To keep costs down, Portalus never had an office. Its members all worked from home. Pirates of the Burning Sea had been free to play since 2010 and survived entirely on premium currency purchases. "[Players] have always given enough support to stay alive—just barely at times—but enough to stay alive," says Taney. Still, PotBS was aging and Portalus’ small team could barely afford to maintain the game, let alone add to it. The years took a toll on the player population, and the studio shrank with it. Taney suspects that many players didn't realize PotBS lived on after a rocky server transition, a suspicion that Salois confirms from his experience playing: "Most found another game. Us old school guys have come back, just no new players." This game honestly is the best full experience land and sea game out there. Yes, it's 11 years old, but it holds its own. Slowly, for six years, Portalus' ability to support PotBS shriveled as its staff shrank. "When the team went from 25 down to 12 down to eight down to five down to three there are only so many hours in a day and it becomes very, very difficult to keep doing those things," Taney says. At one point, he stopped taking a paycheck for six months to help keep the lights on. Whenever Pirates of the Burning Sea teetered on the edge, its most dedicated players saved it from tipping over. "When the game was about to die, you'd have people come out of nowhere and say 'I'll buy $200 or $300 of Burning Sea Notes, [the premium in-game currency], to keep it running,'" says Calico Jack. "Some of these people are people who haven't played for years." 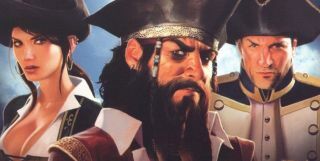 Blackbeard also uses his status as an economic leader to keep PotBS afloat. "I sell ships and I try to get people to buy the Burning Sea Notes. I build ships specifically to try to make people spend that money because if there's no money coming in, the game will close. For me, that's not acceptable. Because then I might as well just lie down and die because I've got nothing else in my life." He's quick to mark the last bit as hyperbole, but the sentiment is familiar to anyone who's invested time and built relationships in an online game. Blackbeard and Calico Jack have been friends for years, forming the close personal relationships of longtime MMO players: Sarcastic banter about each other's personalities earned from years of late nights spent together, intimate knowledge of each other's families and jobs. These bonds keep them playing. "Over the years I have spent thousands of pounds within this game and I don’t regret that," adds Blackbeard. Salois has tried to leave for calmer waters more than once, but still comes back to PotBS. "I've left the game for Darkfall first, then a few other times. But this game honestly is the best full experience land and sea game out there. Yes, it's 11 years old, but it holds its own." Once upon a time, players built guilds around roleplaying entire ship crews. In August 2018, Pirates of the Burning Sea found itself at the center of another storm when Taney’s one remaining co-worker, Portalus’ only programmer, decided to leave. Taney has years of experience as a designer, but simply couldn't run things alone without an engineer. Hamstrung and with little left to lose, he turned to the only resource he had left. "I would encourage community at this time to pull together and take this opportunity to determine the future of your game," he wrote on the official blog. "The game has proven to be more durable than the companies that have operated it in the past due to the strength of the game community." As a potential solution, he proposed a plan where players would become key decision makers, a truly democratic approach, styled after the operations of actual pirate history. "I think that made [property owners Flying Lab] a little nervous. But for me it's like, well, that's how pirates actually worked! It's right in line with the pirate theme. The community is really what's keeping this game going. They're paying the bills. Listen to them." Portalus Games’ blog went silent for months as the property owners weighed the decision. The only thing that Taney knew for certain was that Portalus's days were over. As its owner, he'd made peace with that fate. He hoped PotBS would have a future. But his company wouldn't. "I did not know whether my involvement would continue beyond transitioning the game to another company. I was content to accept my end with [PotBS] if it meant that the game would continue." For players like Blackbeard, it looked as if Pirates of the Burning Sea wouldn't make a comeback this time. "It was pretty dire at the start, to be honest. People assumed the game was going to close once the announcement was made that Portalus wouldn't be [operating] the game anymore. That made the game go very, very quiet." Older games like this, they’ve gotta have some champions. They’ve gotta have some people who are willing to bleed for them. PotBS nearly sunk beneath the waves for good during those months, but players' frantic donations kept it alive. The property owners stepped in to provide a grace period while prospective operators waffled on adopting the game. "Had this situation happened with a game that didn't have the personal support that PotBS does from its hosts, managers, and community, I think the game wouldn't be available today," Taney says. "From a purely business sense, the game should have died." In January 2019, five months after announcing that Portalus Games would close, Taney posted about Pirates of the Burning Sea’s 11th anniversary, and the announcement that Vision Online, who had hosted PotBS’s servers since 2013, would take over as its operator and adopt Taney after his official closure of Portalus Games. "When Vision's announcement was made, old players came back in droves," says Blackbeard, who still plays daily. Vision's CEO Darrell Benvenuto says "I know—viscerally—how much effort is required to put together and balance a deep, complex game like PotBS. Any MMO represents a massive amount of effort, not just from the developers but also from the players who have been active in the game world for many years. If there was something I could do for all of them—a way to preserve PotBS from vanishing, I felt I should do it." Already, Vision has helped PotBS ditch its fleet of original physical servers from 2008 in favor of a few virtual servers, a change that's cut operating costs by 50 percent according to Taney. With that money saved, they've already brought back game master Red Jaq (a sort of in-game community manager and customer support rep), who can be found livening up chat most evenings. Calico Jack and Blackbeard say her presence is a morale boost for crews. They hound her for any information on Vision's plans. She doesn't have much, but she's able to assure them that Taney (Fodderboy, as they know him) is familiar with their wish list of updates. He already has ideas: Bringing back an updated version of the optional subscription Captain's Club and introducing a long-asked-for legacy server, for starters. "If my numbers are right on the estimates of how many people I believe would support that server, it should be profitable," Taney says. "Maybe not hugely profitable, but profitable." Benvenuto, too, has the numbers in mind. Though he disagrees with my use of the word "support" (he hopes to revitalize PotBS, rather than just support it) he does have a picture of the community it will require. "We need to attract thousands of additional players," he says. "Labor is the single greatest cost, and it takes roughly two to three thousand players to generate enough to cover the cost of each engineer." Before the legacy server, or any other large engineering undertakings, can begin, Pirates of the Burning Sea’s community will have to grow and continue proving itself. As long as the revenue from future players is still speculative, Pirates of the Burning Sea isn’t out of the storm. “Older games like this, they’ve gotta have some champions. They’ve gotta have some people who are willing to bleed for them,” Taney says. He’s done just that over the last nine years, and he’s been far from the only one. As for keeping its loyal players, Calico Jack has a request that's often tough to achieve for adoptive studios: "Be worthy of the players that have spent this time and that really care about the game. Be worthy of that. Earn that." When I rediscovered Pirates of the Burning Sea in January, I was in search of fun community shenanigans to write about in a quirky old MMO. From the outside it seemed beloved but doomed, a game that no one would give the release of death. I prodded at it with voyeuristic curiosity, determined to at least find a good story. What I found was a beloved old rig and a crew willing to go down with it. Taney says it best when comparing the game to Malcom Reynolds' ship in Firefly. "Pirates of the Burning Sea is like Serenity. It's a ship. It's a ship you love. It's rickety. It's old. It looks like a death trap to a lot of people. But you want to keep it,” he says, sounding just a bit choked up over the phone. “You want to keep it going."